Are you implying that the cost of a diaphragm seal / pressure indicator isolator plus the cost of a normal pressure gauge or transducer may be considerably less expensive and shorter lead time than having gauges and transducers from "fancy" alloys etc.? With a Diaphragm seal, the pressure of corrosive liquids can be measured or recorded using instruments that are made from standard low cost materials. A diaphragm seal separates the corrosive fluid from an inert fluid that actuates the pressure indicator instrument. Diaphragm seals enable the use of standard low cost measurement and control instruments. Diaphragm seals isolate pressure instruments from aggressive, corrosive, flammable, pyrophoric, and carcinogens or other dangerous fluids. 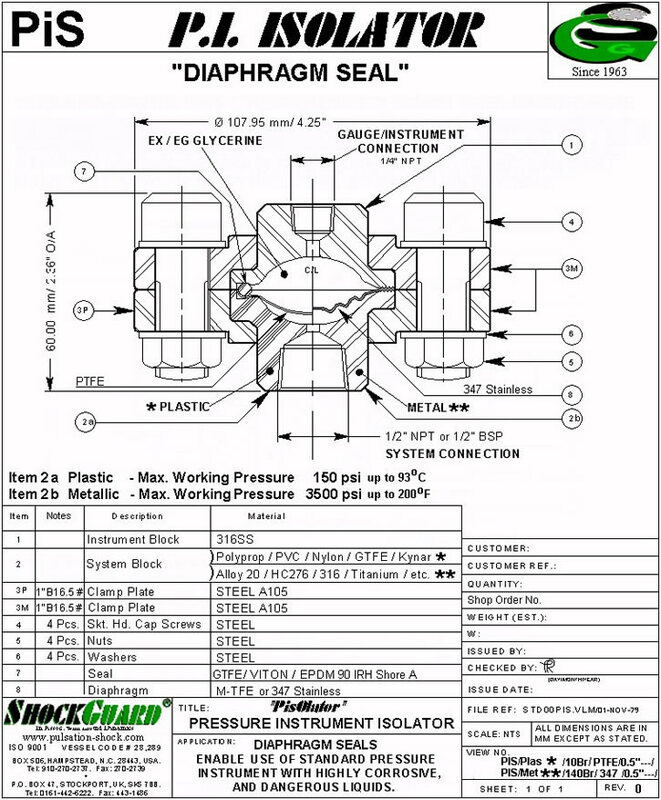 The ShockGuard PisOlator diaphragm seal saves the use of pressure instruments made from exotic materials. Diaphragm seals enable the use of standard low cost measurement and control instruments. A transfer barrier enables the pumping of one fluid to produce pressure in another liquid without the mixing of the two. A diaphragm seal is a flexible membrane that seals and isolates an enclosure. The flexible nature of this seal allows pressure effects to cross the barrier but not the material being contained. Common uses are to protect pressure sensors from the fluid whose pressure is being measured. Diaphragm seals (aka chemical seals) are also used to protect a process fluid from the pressure sensor. Examples of use are: Sanitary processes (food, pharmaceuticals, etc.) where allowing process fluid to accumulate in the pressure port of the sensor would compromise the purity of the fluid (such as milk getting into the pressure port of a pressure gauge and spoiling). Very pure process fluids, where the metal surface of the pressure sensor might contaminate the fluid (such as copper ions from brass leaching into ultra pure water). Pneumatic systems where small changes in pressures must be eliminated, such as those controlling air bearings. You can ask a question or leave a comment about this product using the form below.